I felt compelled to solve it. There were some old boards hidden inside a wall adjacent to the kitchen. Why were these boards there? Why were they inside a wall? Why had they obviously been cut? Why had they been stained? I mean, this indicated that they were originally meant to be seen. The hidden boards. Note how they have been cut (right edge). I love pouring over blueprints. And I really love pouring over old blueprints of the Cross House. The 1894 blueprint of the Cross House basement. See the orange oval I drew? It looks like two small closets, right? But why? And why are they unequal sizes? This would indicate that each had a specific use, right? The closets, or whatever they were, were long gone, having been replaced by a pink bathroom when the house was converted to the Palace Motel in 1950 (New & Modern!). The bathroom was extant when I purchased the house. It is no longer. A few months after buying the Cross House, I closed a door on the second floor which had always been opened. To my surprise and amazement, behind the door was a petite door, about half-way up the wall. My mind immediately raced with memories of movies where children discover just such a door, and, upon opening it, step into a fantasy world. I was breathless. Dare I open it? Was it a time portal? An opening to another planet? An entrance to a magical kingdom of low taxes, no war, and a Congress which actually accomplished things? Well, I was a bit disappointed, but only a bit, to discover that the petite door opened to…a laundry chute. Zounds! I had a laundry chute!!!!!! The door was beautifully detailed, and the interior of the chute was stained boards. Wonderful! But the chute had been severed at the first floor ceiling. Where had it originally gone, I wondered? The petite door about half-way up a wall on the second-floor. I was reading an 1895 newspaper article of the Cross House. It mentioned the expansive basement (it certainly is! ), and its sun-filled laundry room. I knew just what room that was. The basement is full of normal-sized windows typical of a basement. Save one. This room has huge, south-facing windows, enabled by an outside well, like a kinda moat. I had always wondered the why of these windows. Was the room a summer kitchen? I pondered these seemingly non-related mysteries. When the Cross House was built, Harrison and Susan Cross would never have arrived home with bags of groceries. It just was not done! This was the job of the cook and, I assume, house keeper. In large 1890s houses, the kitchen was not a room the owners would have spent any time in; indeed, perhaps no time at all. This was a separate domain, a classic upstairs/downstairs dynamic. This hidden realm was were the servants lived and worked. It has its own entrance (the back door), a servant’s hall (which will be my breakfast room), and a servant’s stair connecting all four levels of the house. However, by the 1920s people who owned large houses did buy their own groceries and did carry them into the house. But at the Cross House, there was no easy way to get from the family entrance (under the porte-cochère on the south side of the house) into the kitchen. While this was not an issue in 1894, it was an issue in the 1920s. So, it seems that the solution was to cut through a hall closet, thus connecting the family hallway directly to the kitchen. These two features were sacrificed to allow for changes in how people lived. 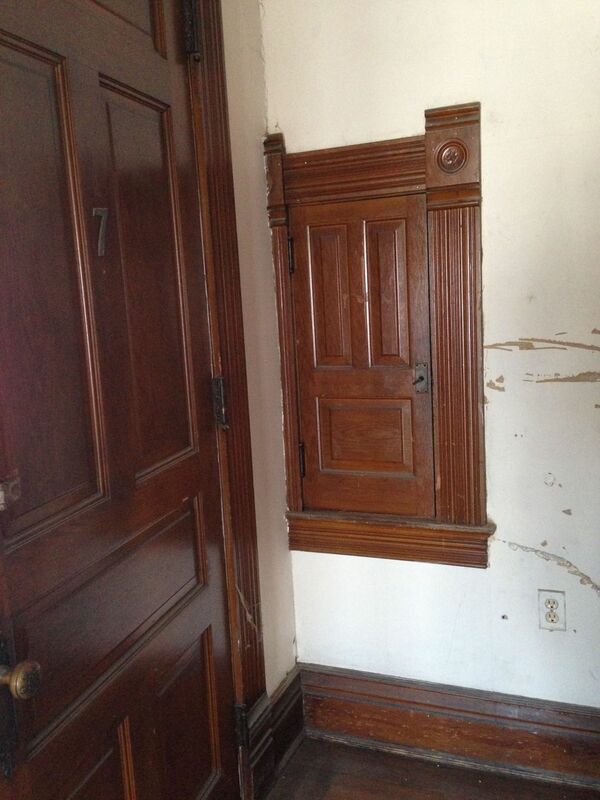 The hidden boards (Clue One) are the remains of the dumbwaiter. This went from the kitchen to the laundry room, below. The laundry chute (Clue Three) had once gone from the second floor, down through the first floor, and down into the basement laundry room. 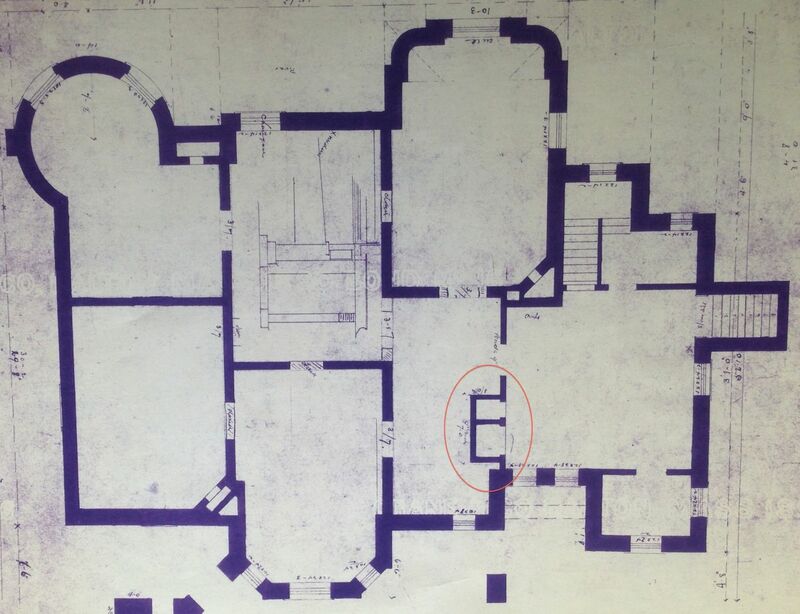 The 1894 basement blueprint shows both these features in the orange oval (Clue Two). The dumbwaiter is the larger of the two niches. Well, having figuring all this out, there was no way — no way! —that I could not reinstate these two incredibly cool features. A company in California still makes dumbwaiter components, and remaining bits confirm the original size of the dumbwaiter. The laundry chute drops straight down. I am going to, quite sensibly, extend the dumbwaiter up to the second, and third floors. 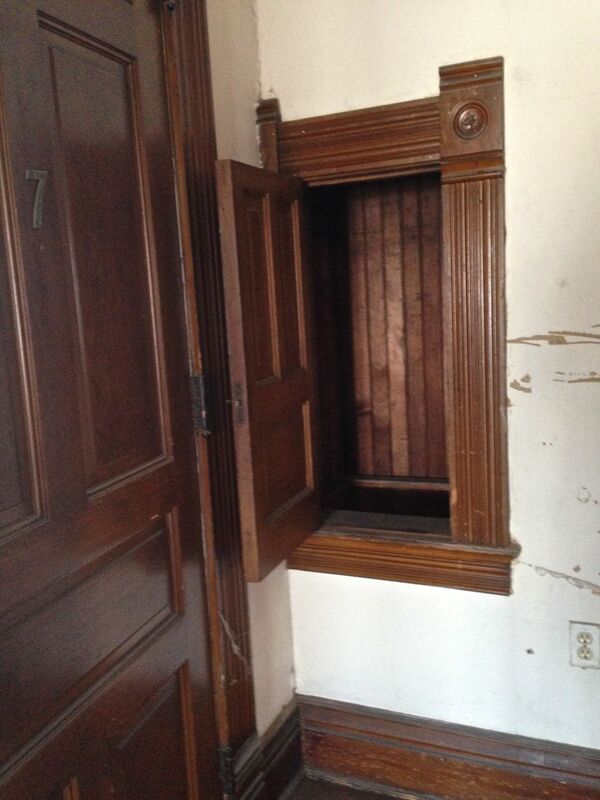 Quite insensibly, the dumbwaiter originally did not service the upper levels of the house. I would love to learn the reason behind that. With great anticipation, I look forward to throwing my soiled clothes down the resurrected laundry chute to the resurrected laundry room, then bringing my clean and folded clothes back up via the resurrected and extended dumbwaiter. I never thought I would pine for 1894 conveniences. 18 Responses to The Waiter Has Been Butchered! EEK! What are those yellow ribbon-things hanging from the first photo? The Cross House is a grand bejeweled time capsule! Ross, you are blessed! 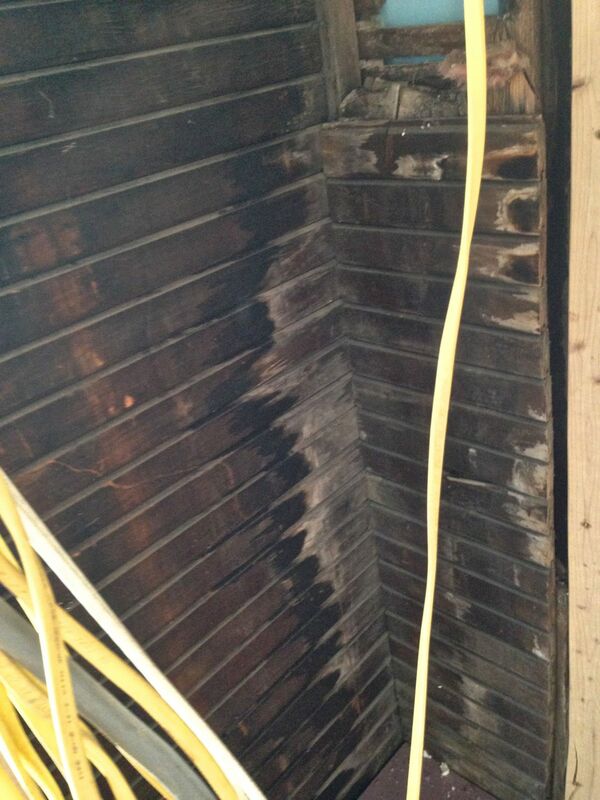 Kudos to you for going to the trouble and expense to restore these features that will surely be a testament to your home’s history for another lifetime! I grew up in a house with a clothes chute and it was a convenience and the inspiration for a lot of mischief for little boys like myself. Pro tip – cats do not like being lowered down a laundry chute with a long scarf that belongs to your mom. You should really have a camera crew following you around. I feel you’re a lot more interesting and informative than anything on HGTV or even PBS. No need to be jealous. Well, until I actually get the dumb waiter rebuilt! THEN…! NOTE TO READERS: Amy has in INCREDIBLE house that she and her husband are lavishing love & attention on. You are too kind! We both are pretty lucky to have such lovely places to take care of. Perhaps a Ross field trip to Amys house would be appropriate. After living in a home with a laundry chute for a few years now, I’d definitely miss it. Historically dumbwaiters were used to bring food from a basement kitchen up to the dining room. That doesn’t seem to be what they had in mind when they built yours. They also didn’t seem to have returning laundry to the bedrooms on the upper floors in mind. Since yours went only from basement to kitchen, I’m guessing that what you’re calling the laundry room in the basement they would have called the scullery. In 1894 a scullery would have been used not just for cleaning clothes and linens, but also the dirty dishes and cooking utensils. For catering to large groups it could also be used as an overflow kitchen. They may even have stored much of their china in the basement and sent up only what they needed for the next meal to the kitchen. After all, a big house like yours would have had a set of dishes for everyday and also a special set for entertaining. They may also have stored preserved food in the basement or had a wine cellar down there. I have a 1895 newspaper article on the house which states there is a sun-filled laundry room in the basement. This can only be one room, which has very large windows in a south-facing moat. The kitchen has two pantries. Good china and silver would have been stored in the Buller’s pantry, and the everyday china in the main pantry. I agree the original family might have stored food in the basement and wine. You have to realize in the 1800’s there was no need to have the dumbwaiter go up to the higher floors. All eating and service needs and bulk of work was done in the kitchen and below. Only maids would be in the upstairs for the cleaning and menial work. Dumbwaiters would have had no use in the upper floors. Also you mentioned there are coal burning fireplaces as well as radiators installed at the construction of this house. The dumbwaiter would have served a way to bring coal up from the basement to the main part of the house for the maids to start all the coal fireplaces, when wanted or needed. Also I understand if coffee and tea were sent upstairs from the kitchen, often times the service tray would also have gone to the second floor through the dumbwaiter for safety reasons. You wouldn’t be bring up hot, delicate tray services up through the servants stairs, too much traffic and accident concerns. And never, ever would you bring a service tray through the main house stairs, to uncouth at that time. The Mrs. would have probably had tea many a time in her conservatory. Make sense? P.S. I love this era so much, I’ve read many books and watched many doc’s and movies of this time. That is why I love, love, love this house. You are bringing this house back to its original time. Sooooo Cool. The gentleman and lady of the house would not have stepped into the working areas of the house. The lady of the house would have overseen it but not in the service quarters. The eighteenth century owners would have eaten in the dining room and the servants, like you said, would have eaten in the servant quarters, which your house has and are going to restore to a breakfast room. I’ve been reading your blog for 2 days now, entranced. I have what I think would be classified as a four sqare home built in 1913. Your plan to reinstate the laundry chute and dumbwaiter for laundry is brilliant! LOL 40 years of carrying laundry baskets up and down 4 sets of 28″ stairways makes me extremely jealous! No chance of a dumbwaiter here. Nor a space for a laundry chute so I can only live vicariously thru yours! Eureka! Our Foursquare has a laundry chute. If we ever live in a house without one, we are definitely going to miss it. One of those little luxuries you don’t appreciate until you don’t have it anymore (the heated tile floor I installed in our bathroom will be another thing we’d miss). Figured it was worth an update. We moved to a different state last summer and sold the Foursquare, but our new house (an Italian Renaissance Revival) has a laundry chute too! Thankfully, we have not had to go back to living without one. Our 2-year-old daughter also has great fun helping put dirty closes down it. The door at the 2nd floor is just above the baseboard, so it’s the perfect height for her (it’s a shallow enough chute that she can’t fall in). The former owner of my house built a cupboard underneath it for storage. Very sensible.